MOSCOW, November 23. /TASS/. Artificial lowering of oil prices will also hit those who provoke it, Russian President Vladimir Putin said in an interview for the TASS special project Top Officials. “If deliberate efforts are being taken to lower energy prices, they also affect those who introduce these constraints,” he said. “This does not at all mean that the sanctions, a sharp fall in oil prices and the depreciation of the national currency will bring about negative results or disastrous consequences solely for us. Nothing of this kind will happen!” Putin assured. “Problems arise, they are present and they will increase, deteriorating the situation but not only in Russia but also in our partners’ countries, including in oil and gas producing countries,” Putin said. “But what is the breakeven point of this production?... 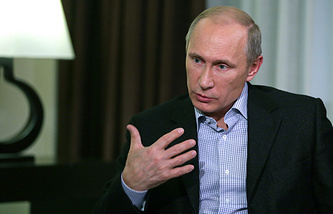 Estimates range from $65 per barrel to $83,” Putin said. “Now the oil price has fallen below $80 per barrel. Shale gas production is becoming unprofitable,” the president noted. “Perhaps, the Saudis specially want to “kill” their rivals…” he assumed. The president also sees objective reasons behind the decreasing oil prices. “Supply has increased. Libya is producing more, as well as Iraq, no matter how strange it may seem, despite all its problems… Illegal oil has appeared at $30 per barrel, which the Islamic State is selling on the black market. Saudi Arabia has increased extraction. Meanwhile, consumption has contracted due to the period of certain stagnation or, say, slower-than-projected global economic growth,” he said. “Let’s assume that there are also partners’ purposeful steps on the world energy market. Can we presume this? Yes, we can,” Putin agreed.